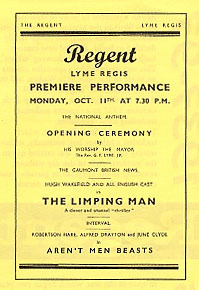 The Regent was the original home of the Society, and Lyme's much-loved Cinema. A major fire in March 2016 destroyed the auditorium and did other damage, forcing the closure of the Cinema, and the Society's move to a new home at the Marine Theatre. The Cinema is to be rebuilt, and we look forward to returning when it is once again entertaining residents and visitors to our town. LYME'S FIRST CINEMA was housed in the Assembly Rooms, which were sited on the present Cobb Gate car park. Mr Raymond owned and ran it with the help of his daughter who used to accompany the films on the piano. It was from Mr Raymond that the Hardys, father Walter and son Donald, bought their first projector, when they began exhibiting pictures at the Drill Hall in the twenties. This hall, now known as the Marine Theatre, could not be used for film projection once the talkies arrived, and the Hardys did not at first know how they would retain their audiences, swollen by holidaymakers. The cinema at Axminster (The PLAZA - now The Guildhall), opened about this time for the showing of talkies and the patrons were deserting the silent films at the Drill Hall for the novelty of the shows over there. Someone suggested to Donald Hardy that his only course of action was to build his own cinema. He told the story later like this: "After discussion with my father and after borrowing money from the bank, we bought the site of the Bow House Hotel, demolished it. and set about building a new cinema. A friend of mine had just built the Regal Cinema at Seaton, and after discussion with him we decided to use the same architect, Mr W. H. Watkins of Bristol." MR WATKINS' PRACTICE in Bristol had architects who specialised in design of cinemas at a time when the film industry was beginning to score tremendous successes in Great Britain as well as on the continent and in the United States. The Radway in Sidmouth, part of the Charles Scott group of cinemas today, was one of the earliest, with design elements that looked back to the twenties. The Regent was more forward looking with features that we now recognise as typical of the thirties - a simpler, more elegant style devoid of the Egyptian or pseudo-classical decoration of earlier houses and with a beautifully restrained decor in which apricot, cool green and gold predominated. There was never anything garish about the Regent; it looked and felt luxurious - a real asset to a small seaside resort, a picture palace in the true sense of the word. The opening show was on Monday, October 11th, 1937. The stadium-type auditorium, a design feature favoured by Mr. Watkins, who maintained that audiences did not care for seating under balconies, was full to capacity. The Mayor and other dignitaries of the town watched a thriller with an all-English cast and were promised by Donald Hardy that "Our policy will be to serve you courteously and well and to provide a consistently high standard of entertainment." Mr. Hardy's promise has been honoured. Part of the Regent magic was the holophane lighting system that enabled the projectionist to vary the effects in the auditorium, particularly around the proscenium with red, green and blue lights concealed in troughs forming part of the decor. The three colours were wired on separate circuits and the sequences and combinations of colours were impressive. Later, the machine operating the circuits became too costly to maintain and the system was discarded. However recent experiments with the lighting, using some of the old 'gelatines' have shown that attractive effects can still be obtained with a little care and imagination. The Second World War did not frighten Mr. Hardy, who continued to put on a programme that changed three times within seven days; Monday - Wednesday, Thursday -Saturday and Sunday showings. The blackout regulations had to be observed. So the entrance doors into the foyer had to be heavily screened and the lighting in the upstairs lounge was discreet, to say the least. But the atmosphere in the auditorium was as always inviting and intimate, enhanced if anything by the contrast between the brightly-lit screen and the darkness of the world outside. There was a wide selection of films, something to appeal to anyone looking for a few hours escape from the unpleasant realities of war, even in the hard winters when getting to the cinema meant walking or sliding along icy paths in the pitch-dark. Local people came to support the Regent and joined the queue down Broad Street with American soldiers and members of the British forces on leave. The sight of Donald Hardy, his pink cheeks bright, always looking cheerful and dapper, was thoroughly reassuring. In 1973, Mr. Verncombe acquired the Regent from Mr. Hardy, and it was later taken into the Charles Scott Group, joining the Radway at Sidmouth, the Savoy at Exmouth, Film Centre at Bridgwater, the Alexandra at Newton Abbot and the Riviera at Teignmouth. THE LOCAL PRESS recorded the Regent's Golden Jubilee with well-deserved enthusiasm. The Bridport and Lyme News headlined its tribute with the words "Regent is Jewel in Lyme Crown", and, under a photograph of Mrs Pat Wilton (who still acted as cashier), noted: "Lyme Regis Regent Cinema - the Golden Age movie house which has survived to celebrate its 50th Anniversary - is a gilt-edged asset to the town." Ex - Mayor and then Chamber of Trade Chairman, Mr Mike Hartley succinctly stated the main reason behind the cinema's survival into an age when many grander enterprises had folded, when he remarked that "Lyme still has a cinema because it is supported by local people who are well catered for." Its success story is indeed remarkable; Lyme Regis is believed to be the smallest town in England with its own cinema. AS PETER HOARE puts it, "The Regent survived the difficult years when television threatened to be the death of the cinema, and resisted the temptation to run Bingo for salvation." Now, with the number of cinemagoers on the increase throughout the country, the future of the Regent should be assured But continued success does not come without effort and, with increasing costs a beautiful but period building requiring constant maintenance and sensitive restoration, much thought is being given to the development of the enterprise. At the time of its Golden Jubilee, Peter Hoare said, " / see a bright future for the Regent.... I have been looking into the possibility of having two screens instead of one. Certainly there is enough room even for three. But I am not sure that I will change things because there is the danger of altering the character of the place and that is something I do not wish to do." In this wish many others join. In fact, hardly a week passes without a member of the audience, detaching themselves from the queue at the kiosk to enquire after the history of the cinema. Or to say they heard about the cinema and would like to stay after the show to take a look at the auditorium that has been cherished in its original form without concession to changing fashion. When first time visitors approach the box-office they may, for example, ask for " two adults for Robin Hood ". And when asked if they wish for a seat in the circle or the stalls they are thoroughly bewildered. The terms mean very little to them, so accustomed they have become to multi-screen houses. Once inside the auditorium, they derive considerable pleasure from seating arrangements that hark back to more leisured times, when a visit to the "pictures " was indeed a "proper night out" and not a quick dash to pick up the feature and a rushed return to catch the late show on T.V. Those who have grown up with the Regent as well as those making its acquaintance for the first time must hope most sincerely that it will go on into its later years boasting all the modern comforts whilst still retaining its period charm. DONALD HARDY, with his father, was the pioneer of the cinema in Lyme Regis. The Hardys had the vision to engage cinema architectural specialist W. H. Watkins to design the Regent and, as a result, 60 years later, the town has what is essentially a modem cinema . Donald Hardy sold the cinema in 1973 but retained his interest in it right up to the time of his death. ROBERT TEMPLEMAN was the projectionist at the Drill Hall and moved to the Regent when it opened. In the early days the projection box had to be double-manned because the films were inflammable material and there was always the threat of fire. Later, the film was made on a safer base and the projectionist worked single-handed. CYRIL WELLMAN was the second man in the box. He started work at 14 years old without having much idea as to what projecting films was all about. He soon became an enthusiast and mastered all there was to know in the job where the technology was constantly changing. He commented, "I've just had to keep up with it as I've gone along" Hardly missing a day's work over many years. Cyril has become identified with the Regent, and with its mission to bring year-round entertainment to everyone in Lyme Regis and in holiday-time to the visitors who are surprised to find that films barely released in London can be viewed in a cinema with a period air. In 1972 JOHN FOWLER started work at the Regent as Cyril's relief projectionist, working two nights a week to give him a little time off. John had a little experience at this work as he was friendly with the projectionists at the Plaza in Axminster, and had helped out on occasions. After a few years of working with Cyril and the Regent he was helping with maintaining all the equipment, and had a good knowledge of the building. By now films were being made in stereo and John knew that the Regent was not able to afford this expensive equipment for many years to come. So John, an electrical and electronic enthusiast and cinema addict, was soon devising schemes for improving the quality of the projection and providing even more brilliant effects to enhance films where the audience gets it thrills from cataclysmic bursts of sound. In 1990 Cyril became ill and went into hospital. So John stepped in and ran the box until Cyril was able to return. John said later "When I started work here Cyril shared his wealth of knowledge and experience with me, and with out it my job would have been made so much harder. Running a projection room is a lot more involved than you might think." After 12 month Cyril was able to return as John’s relief. But sadly he was never to return to full work again. John ran the box for three years as well as holding a full time job. BARRY FOWLER, John's brother started as his relief projectionist. Six months later Barry took over as chief, while John stood down to do his relief. John said "My interest in the Regent is still as high and I will do all I can to help. "I regret having to stand down but working a 18 hr day year in and year out is just not on!" he still does all the relief and holidays in the box. Since BARRY FOWLER has been running the shows the Regent has been awarded the Cinema 100 award on behalf of CYRIL WELLMAN And John's ambition has come true, as the Regent had surround sound fitted in 1996. Leader of the front-of-house team and in overall charge of the day-to-day running of his mini - empire, is ALEX ORME. He is responsible for every aspect of customer care until they leave at the end of the performance, chatting animatedly if the film has been comic or provocative, looking rather thoughtful if it has been romantic, serious or simply terrifying. Alex lives for the cinema. Spends most of his time there supervising the ushers young and not so young, who work on a rota basis, the cashiers and cleaner, dealing with a constant and massive flow of bookwork, checking and rechecking everything for the confectionery in the kiosk to the exact timing of the "forthcoming attraction"